The platform provides detailed demographic and psychographic analysis of Twitter audiences, conversations, and groups of users. The platform provides detailed demographic and psychographic analysis of Twitter audiences, conversations, and groups of users. Additional features include an Influence Search tool that allows clients to find and rank people, brands, and media that influence various target audiences on Twitter, YouTube, Instagram, and Facebook. Plans range from about $350 per year to about $4,320 per year. Pay-per-use options and API access are also available. Ben Saine, executive in charge of social intelligence at Creative Artists Agency (CAA), has been using Demographics Pro since August of 2013. It’s easy to use. After you log on, there are a series of tabs. 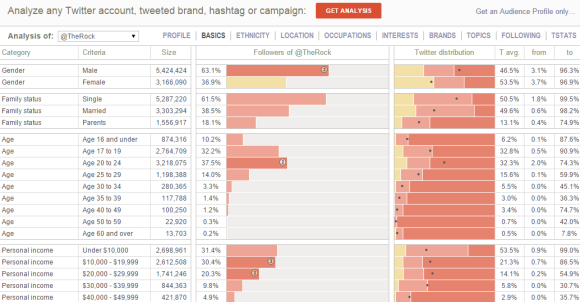 In the analysis tab, you can enter a Twitter handle or a hashtag and it generates a report. I export the results into a PDF and share it with our in-house client teams. There’s also a tailor tab that allows you to look up an audience by demographic and see who is influential to that audience. A comparison tab allows you to look at multiple Twitter accounts or hashtags in a consolidated view. If we have a problem, I email my dedicated account executive at Demographics Pro and give them a description of the error. They are quick to respond to let me know the message was received and the problem is being looked into. I also get periodic updates on resolution of the error. It’s extremely rare that we have problems. We have a unique culture of collaboration that focuses on what’s best for our clients, and what we do from a technology standpoint plays into that. We have a team-based approach to client service, and the depth of reporting that comes from Demographics Pro means there’s a little something for everyone on the team. Understanding the audience demographics for our clients and their projects gives us insights into how to take them to market. For example, looking at the demographics of one of our music clients and being able to determine that audience’s brand affinity on Twitter gave us a lot of insight that we used to create a new and exciting brand partnership that benefits both our client and the brand partner. It’s all Web-based. They have an API, but we don’t use it. We get rich quantitative demographics on audience and brand affinities for our clients. The value proposition is great for us and customer service is excellent. They’re very good about soliciting feedback from us and we have a constant feedback loop with them. It only covers Twitter. We have some clients that don’t do anything on Twitter, so the insights are more limited for those clients. It’s really robust for what it offers, but I’d like to see more data sets added besides Twitter. Specifically, I’d like it to cover YouTube, Instagram, and Vine because we get a lot of client requests for insights into those channels. Topsy (acquired by Apple in December 2013): provides real-time social search, indexing, and analytics tools. Nielsen Social: includes tools to analyze activity and reach of TV-related conversations on Twitter (including age and gender demographics) and more.